Is it just me, or do you love (pun intended) heart jewelry too?! The heart is a symbol of many things including love, romance, desire, passion, affection and more. No wonder it's irresistible! Whether you prefer the muted tones and colors of a heart-shaped gemstone or the dazzling sparkle of a Swarovski Crystal Heart, there's no denying that a heart adds a certain feminine touch to all Crystal Allure Jewelry designs. Every year I tell myself, I'm not going to do any heart beaded jewelry. But, that never lasts long. I simply cannot resist the urge to create designs using hearts. So, this year, I want to share a little love with you. 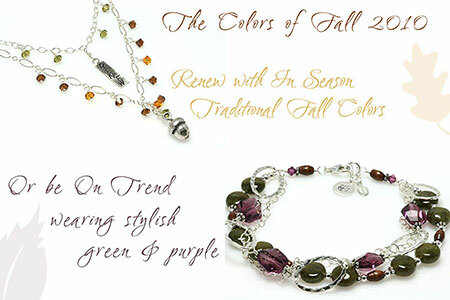 From now until February 5, 2011, shop select Heart Jewelry at Crystal Allure Jewelry and receive 20% off! Simply enter coupon code, sparkleheart*, at checkout to receive your discount. *Coupon discount applies to select available heart jewelry only. It does not apply to any other available jewelry, custom jewelry, or past heart jewelry purchases. Joyce had visited Crystal Allure Handcrafted Beaded Jewelry and found a pair of earrings that would coordinate with her allure crystal necklace her brother-in-law purchased for her sister. She contacted me to create a custom pair of emerald Swarovski Crystal earrings to complement this necklace and she also requested a custom pair in sapphire too. We took an existing handcrafted beaded earring design and customized it a little more to fit her needs and desires. The results were simply stunning. A minimalist look in a purely feminine style with a hint of sparkling presence. One of the things I love most about Swarovski Crystal is there are endless possibilities when it comes to color and cut options. I find I could make the same earrings 20 times over and never get bored with the brilliance of Swarovski Crystals. Their quality is unmatched which is why they are the hallmarks of my designs. The first pair of earrings feature round Swarovski Crystals accented by a sterling silver bead and topped with diamond shaped Swarovski Crystals in sapphire. Earrings are finished with 14 karat gold fill leverback ear wires. The second custom pair of earrings feature round Swarovski Crystals accented by a sterling silver bead and topped with diamond shaped Swarovski Crystals in emerald. Earrings are finished with sterling silver post ear wires. Length is 1/2 inch from the bottom of the ear wire. An Information Desk is for 'Information' Right?! Correct me if I'm wrong. 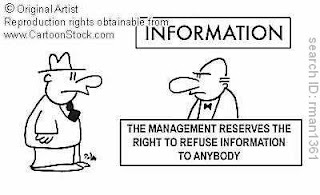 But, isn't an "Information Desk" a place to well...get information? Sadly, I had the unfortunate task of visiting our local Human Services building yesterday, without a clue as to what I had to do to file some necessary paperwork. But, the good news was that as soon as I walked in I saw the "Information Desk". Great. There were two people behind the desk. One on a computer another seemed like a "floater". He kept calling out that if you were there dropping off paperwork, you could go see him. Hmmm. Well, I was technically just dropping off paperwork but did have a few questions too. So after a few people jump ahead of me, I get my chance. I start walking toward him and open up the paperwork in my hand. With almost a disgusted look on his face, he sternly tells me (almost shouting), "That's an application. You have to wait in line". Well, geeze, okay then. Back in line I go. Now the office closes at 4pm, it's now 3:45. I'm next in line and get called up. The woman quickly starts scanning my paperwork, stamps it but then tells me pages X through X need to be completed (education level, income, etc). I tell her that the application is not for myself but for someone in my household. Long story short, she "advises" me to complete the application so it doesn't get returned for being incomplete (even though she tells me they won't need this information to process the application) and to come back at 7:45 AM any morning and wait to see someone. That way, I can ask any questions I might have at that time. I persist about why I need to supply my personal information and she tells me, "We're the state. We have all that information and much more about you. All we have to do is press a button (on the computer) and it's all right there." So, I think, well, thank for your that most accurate vision of what feels like an invasion of my privacy. BUT, I ask, "If you have all this information, then why do I need to fill it in?". She decides that she doesn't like my logical question. So she proceeds to "shoo" my off by telling me again to complete the application, come back, and "I'm sorry I need to take the next person" (as she pushes my paperwork towards me and motions for the next person in line to come up). OH! I'm so sorry, did my time at the "Information Desk" expire?! Oh, my apologies. I didn't realize I only had 3 minutes of your time. I'm beside myself for having taken so much of your precious time in trying to understand things I haven't a clue about. Have you ever had this or something similar, happen to you? The Transplant Awareness Survivor Heart Bracelet (B173-TX) has been so popular that I customized it in red for a customer in celebration of her daughter's heart transplant anniversary. I love every design I produce and especially love this design so I have begun expanding the design for other awareness causes and colors. 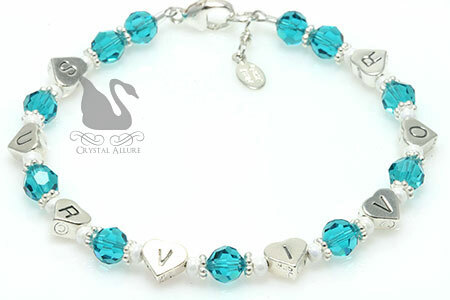 Now available at Crystal Allure Jewelry is our unique teal crystal awareness bracelet. A sparkling beaded strand of teal Swarovski Crystals, sterling silver beads and letter heart beads that read "SURVIVOR". Teal awareness bracelet measures 7-3/4" and is finished with our signature jewelry tag. Call me unaware but I was completely surprised to learn PAP smears do not detect ovarian cancer. Then what the heck do I do them for? I know. Precaution. But still, my whole focus of doing them was because I had thought (up to today) that they detected ovarian cancer, if it existed. How about you? Did you believe PAP smears detected ovarian cancer? Listen to your body and if in doubt, see your doctor. YOU are your best advocate. 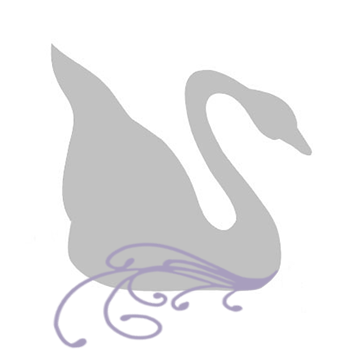 Help spread the word: Ovarian Cancer -"It Whispers -So Listen!" "I love the breathe quote. 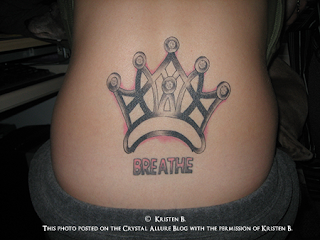 I have the word breathe tattooed on my back. Im 6 months post transplant and loving life." At one time I too wanted to get a tattoo but since I couldn't figure out what I wanted, I never went through with it. Kristen was kind enough to share her personal Breathe tattoo with me via email. I thought it was amazing and asked her if I could highlight it on my blogs. With her blessing, I'm sharing it with you, today. Thank you to Kristen for sharing your personal tattoo with me and my readers and if you catch this post -can you share why the crown above it? What does that symbolize? And HAPPY 6 MONTHS POST TRANSPLANT ANNIVERSARY to Kristen!! Happy New Year!!! I hope everyone had a safe and fantastic New Year! As a great start to 2011, I have some good news to share with you. 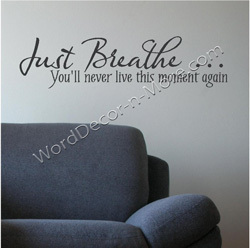 Back in November 2010, I introduced Word Décor 'n More and the fantastic Just Breathe vinyl wall quote contest. Today I'm excited to announce Andrea of Word Décor 'n More has generously offered to donate a portion of the net proceeds from the sale of this wall quote to the Lungs for Life Foundation! It's a perfect collaboration of the Lungs for Life brand and this inspirational product. I am most grateful to Andrea for her generosity and look forward to a long and successful relationship. Some of you might recall, I founded the Lungs for Life Foundation, in 2000, in memory of my oldest brother, who had cystic fibrosis and was on the waiting list for a double lung transplant. As a way to help support the mission of the Foundation and because, at the time, nothing existed like it, I began designing cystic fibrosis awareness bracelets and organ lung transplant awareness bracelets. The bracelets quickly became very popular, sold worldwide and soon after Crystal Allure Jewelry was born. You can help make this collaboration a success simply by sharing this good news with your friends, family and social network connections. And don't forget to pick up your own Just Breathe wall quote! The Just Breathe vinyl wall quote is perfect for adorning your walls and raising awareness of organ donation and transplant to all your visitors. You can choose your preferred size and colors over at the Word Décor 'n More website. Live every moment to its fullest!